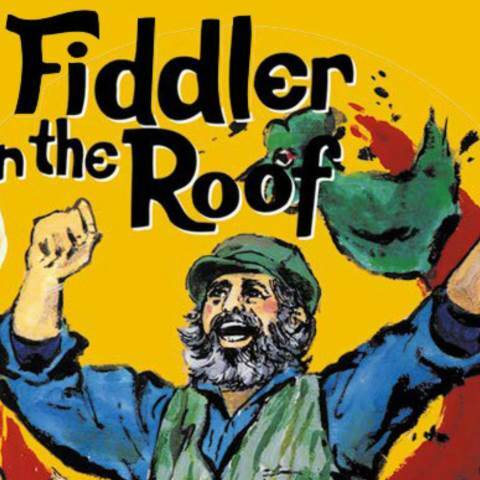 Darlington’s fine arts department will present “Fiddler on the Roof” Feb. 15-17 at the Rome City Auditorium. Doors will open Friday and Saturday at 7 p.m., with showtime at 7:30 p.m. The Sunday matinee begins at 2:30 p.m., after doors open at 2 p.m.
Touching audiences worldwide with its humor, warmth and honesty, “Fiddler on the Roof” is a staple of the musical theater canon. Winner of nine Tony Awards when it debuted in 1964, this universal show is the brainchild of Broadway legends, Jerome Robbins and Harold Prince; songwriters, Jerry Bock and Sheldon Harnick; and book writer, Joseph Stein. “Fiddler on the Roof” was one of the first Broadway musicals to deal with serious issues such as persecution, poverty and holding on to one’s beliefs. A 1971 movie version directed by Norman Jewison was nominated for Best Picture and picked up three Academy Awards. Set in 1905 in the little village of Anatevka, the story centers on a poor dairyman Tevye, played by sophomore Owen Payne, and his five daughters (played by Abby Burris, Giulia Verzino, Maggie Inman, Kathryn Davidson, and Grace Ann Lundy). With the help of a colorful and tight-knit Jewish community, Tevye tries to protect his daughters and instill them with traditional values in the face of changing social mores and the growing anti-Semitism of Czarist Russia. Rich in historical and ethnic detail, the musical’s universal theme of tradition cuts across barriers of race, class, nationality and religion, leaving audiences crying tears of laughter, joy and sadness. “Fiddler on the Roof” is the perfect mix of audience-pleasing humor and heart. There are 65 Upper School students involved in the cast and crew and there is additional support for the play coming from the stagecraft class and an iPeriod. “Fiddler” is a show that Daniel has loved since she was a teenager. Tickets for the event can be purchased in advance online at www.darlingtonschool.org/musical, or at the door on the day of the show. General admission tickets are $10. Tiger Booster Club members and current Darlington families may request reserved seating for no additional cost. The general public can purchase tickets in the reserved section for $15 each. All reserved tickets are offered online only and are available on a first-come, first-served basis. Please note that online ticket sales will close two hours before showtime. After that time, general admission tickets may be purchased only with cash or check at the ticket table in the lobby before each performance. On Friday and Saturday, the ticket table will open at 6:45 p.m. and doors will open for seating at 7:00 p.m. On Sunday the ticket table will open at 1:45 p.m. and doors will open for seating at 2:00 p.m.
For more information about Darlington's production of “Fiddler on the Roof,” contact the box office at 706-368-5256, or by email at boxoffice@darlingtonschool.org.